Do Turtles Stop Eating in the Winter? In the wild, the environmental changes that happen right before winter trigger turtles' instincts to hibernate. Colder temperatures, reduced number of daylight hours and a decreased supply of food make some turtles want to take a long winter's nap. If your turtle isn't eating as much as usual as winter approaches, that could be a sign that he wants to hibernate. However, you shouldn't stop feeding him because you assume that to be the case. Most Asian, European and North American turtles hibernate. Usually it's in response to the climate changes that signal winter, although even if they have a plentiful supply of food and a toasty heating lamp to bask under, some still might choose to hibernate. Some of the turtles who heed nature's urging to sleep the winter away include bog turtles, eastern box turtles, snapping turtles, painted turtles and wood turtles. Since hibernation is mostly a natural reaction that allows turtles to survive temperatures and food scarcity that could kill them, some turtles don't have to shut down over the winter. Those who live in climates with mild or even warm winters won't experience much of a change, if any at all, to their normal living circumstances. So depending on where they live, the Florida and ornate box turtles and the spotted turtle may not hibernate over the winter. There are also species of turtles who, as a rule, don't have it in their nature to hibernate, including the Chinese box turtle, the Gulf Coast box turtle and the Malaysian box turtle. Depending on what type of turtle you have, he might insist on hibernating even if you provide him with ample food each day and maintain the temperature in his habitat. Turtles have to be healthy in order to successfully hibernate, though. If your turtle's immune system isn't in top shape, hibernating could be too stressful on him. He has to have put on enough weight to get him through the winter without eating, too. Have your vet check your turtle out before allowing him to hibernate to make sure that he's in the best condition for it. You should always consult an experienced veterinarian regarding the health and treatment of your turtle. If your turtle checks out OK with the vet, then start reducing the temperature in his tank by two or three degrees each day, but don't allow it to go any lower than 50 degrees Fahrenheit. A hibernating turtle needs this reduction in temperature to help slow his metabolism down since he won't be eating. You can reduce the amount you feed your turtle as he's preparing to hibernate, but don't stop feeding him completely until you notice that he is no longer consuming what you give him. Provide him with a supply of hay or damp moss, enough to burrow under. If he has burrowed under materials you've provided, you won't need to do anything other than maintain the habitat temperature at 50 degrees, although you may want to cover the tank with a cloth to keep it darkened. After about 10 weeks, you can begin increasing the temperature by a few degrees at a time, and allowing light into the habitat to encourage your little guy to wake up. Begin feeding him again when his habitat is back to the normal temperature and you see him moving around. 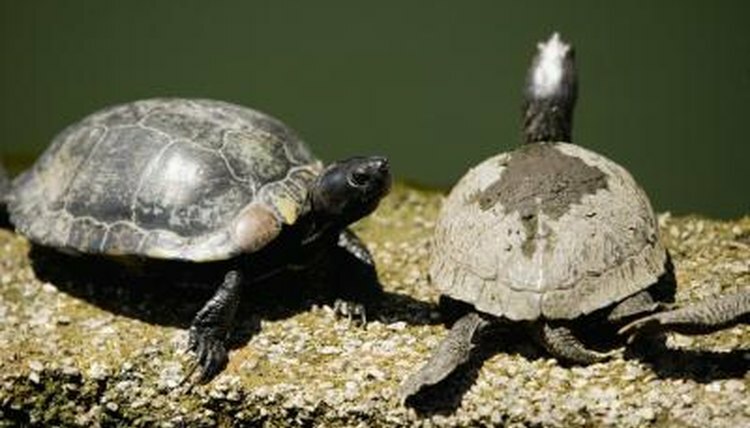 Turtle: Your Happy, Healthy Pet; Lenny Flank, Jr.
What Changes in an Animal's Body Occur During Hibernation? What Does It Mean When a Turtle Keeps Flipping Over? Why Does a Yellow-Belly Turtle Eat The Gravel Rocks in The Tank?